Well, the red rimmed blue eyes and white pallor can only mean one thing - the walls have been patched and sanded in the once-was-closet. I had intended to take copious pictures of the process, but really, what can I say that hasn't been said a hundred times before. Despite what many contractors would have you believe, patching walls is not rocket science. 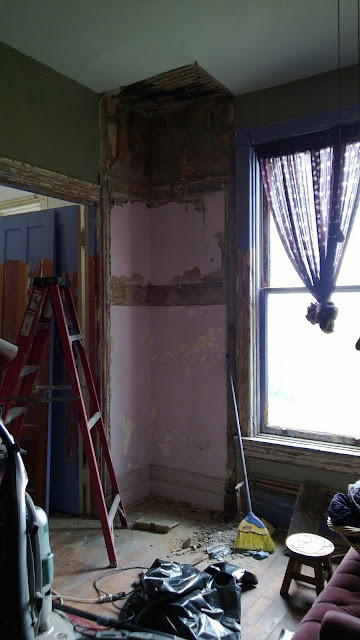 When we bought the house, huge sections of the walls and ceilings were on the floor, and more came down as we rewired and repaired our radiators. 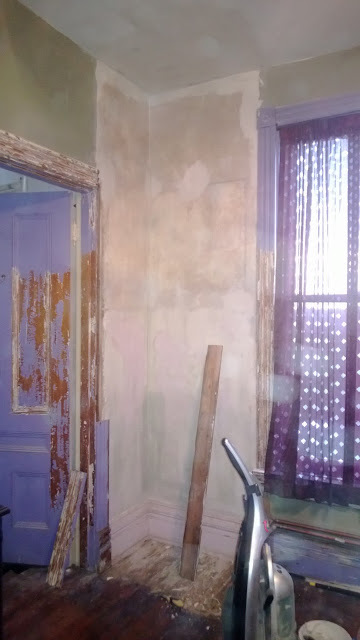 I was told by everyone I spoke to that I could never learn to plaster well enough to make repairs, and that if I was going to DIY it I should just rip it all down and drywall. Bleh. I hate drywall nearly as much as I hate vinyl and the color white. So I read the Petch House blog, and the Dept. of the Interior Preservation Briefs, and I plastered. And it turns out I'm not half bad at it, although issues with my joints prevent me from holding a hawk and large trowel. That said, the sections of the closet were so small, and I was on such a time crunch that we decided not to three coat it in this case (plaster would have been three days, plus a week or two cure time before paint. First I stripped the wallpaper, I use a couple of different scrapers and fabric softener and hot water in a spray bottle (about a 1:6 ratio). The fabric softener has done more to remove the abandoned house smell than any other thing I've done. I spray and just keep everything damp as it penetrates - in rooms like this with painted paper, scoring it is definitely helpful. After that's clean and dry I wash off the residue with TSP, hot water, and a green scrubby. Strip wallpaper before repairing plaster, I can guarantee you'll need to repair more than it looks like at first glance. After everything's dry I clean out all the rotted plaster from the holes with a 5 in 1. I go down to the lathe (and clear out the plaster from between them) in any section that's not just delamination of the finish coat. Once the worst of the crumbles has been conquered I dab on plasterweld to the lath and inside edges of the plaster, and wait for that to dry (the waiting is the main theme of any plaster repair). For this repair I didn't have any holes larger than 5"x5" (and the square ceiling batch was nearly flush with 1/4 inch drywall), so I went with durabond. Holes bigger than 3"x3" get wire lathe screwed into them (you can also use blue board or drywall in larger holes, which I did in the ceiling patch), if there's not enough support for the wire lathe just add more wood lathe. I normally don't patch with drywall, but in this case there was an enormous old raccoon nest in the eaves that was oozing through the lath, I need to crawl into the third floor knee wall space to clear it out, but in the meantime I didn't want my plaster keys bonding to that disgusting mess, and blue board only comes in 1/2 inch, not 1/4 inch. None the less, we're sanded and painted, although stripping the trim and repairing that section of floor will wait till fall. At least working inside all day is a pleasure when it looks like this outside . . . I greatly admire your plastering ability! That looks great now. it's not great, but it seems like good enough blends in better with the old plaster walls anyway! The AFTER picture looks great! Can"t believe the difference! Good job! Thanks! It's amazing how much different the room feels . . .